A wonderfully unique outdoor playground fit for a Prince! Imagination, creativity and adventure play were the inspiration behind the design and development of Thomas’s Battersea School Playground, creating a wonderfully unique outdoor environment fit for a Prince! The Builder’s Area allows children to develop their problem solving and creative skills with a bobcat and crane, a hand-controlled conveyor belt and concrete mixer, wheel barrows and bricks all masterfully crafted from wood and foam. A small workshop, complete with individual personalised hard hats and high-viz vests completes the area. The Play House has been masterfully designed to be multi-functional, ensuring that the children have a variety of imaginative play options. 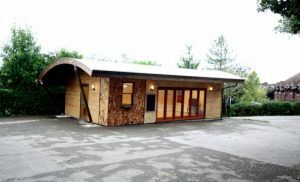 Whether it be a garage, a shop or a restaurant, the quaint wooden structure has been configured to encompass all three options, depending on which side is used. In the centre of the playground the Water Play and Hobbit Hole have been purposefully designed to encourage creative play. 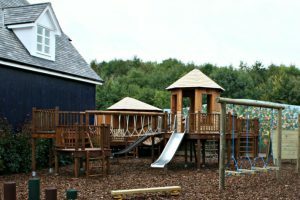 The water play area, built around a large grass mound with water pumps, a wooden bridge, a pebble style beach, storage area and a boat sandpit create a unique space for the children to enjoy fun and stimulating messy play. As you venture into the hobbit hole a large cave opens providing a wonderful world of adventure for the children to discover and explore. A Trike Track meanders around the Hobbit Hole, providing a fun and energetic approach to road safety with road signs and road markings. Thomas’s Battersea School Playground has been magnificently transformed into every child’s adventure play delight, catering for both the creative and active child alike. Blue Forest are proud to have designed and built the new Bicester village play area tree house at Bicester Village Outlet Shopping Centre.